In 1779, the Congregational Church laid out school districts for Burlington. Each of the nine districts had its own schoolhouse—most of them just one room. 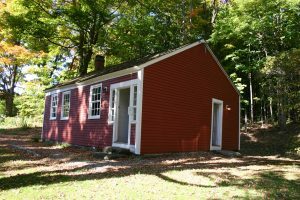 The red Center Schoolhouse was probably built between 1779 and 1800 and was used until 1948. 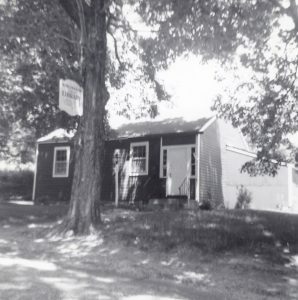 The schoolhouse served all of the children in 1st-8th grade living in the 1st district. The district stretched about a mile out from the schoolhouse. Students would walk to school each day. The Flag Day celebration and 8th-grade graduation was held on the Burlington Town Green each June. This was the only time when students from all of the district schools got together. Early on, few children received an education beyond 8th grade, but those who did had to go away to school or attended high school in Farmington, Canton, or Bristol. The school year was once very different from today. There were two terms: four months during the winter, and another five months starting in April or May and running through the summer. That way, children could help their families with planting and harvesting crops. In 1813, teachers’ salaries were between $6 and $9 per week. There was one teacher, who taught reading, writing, math, spelling, geography, history, and more to students of all different ages. The younger children sat in the front, with the older in the back. Most of the school work was done independently, but older children would sometimes help the younger ones. The school was heated by a wood-burning stove in the center of the room. Boys would bring in the firewood. There was no running water, so students used the nearby outhouses. In 1909 the town took over the schools from the old district committees and hired a superintendent. In 1919 the town began providing free textbooks. 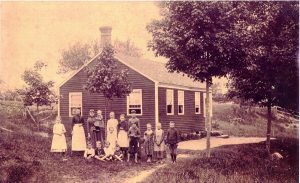 Power lines eventually reached Burlington, and in 1924 one electric light was installed in each schoolhouse. The one-room schoolhouses closed in 1948, and the Burlington Consolidated School (now Town Hall) opened for the 1948/49 school year. Lewis Mills High School opened in 1956 and Lake Garda School opened in 1965. Har-Bur Middle School opened in 1973. The Center Schoolhouse is open for community and special events throughout the year. Check our Events calendar for public hours.